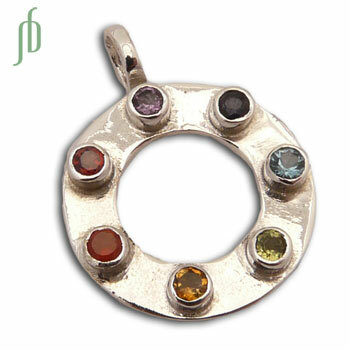 The seven stones of the chakras form a circle to bring you unity and contentment. It has the stones of the seven chakras set in sterling silver. The semi-precious gemstones are : garnet, carnelian, citrine, peridot, apatite, iolite and amethyst. Chakra charm with a spring clasp. The charm has the stones of the seven chakras: amethyst, iolite, apatite, peridot, citrine, carnelian and garnet. Comes on a 7.5 inch adjustable bracelet. Happiness is coming your way with our original chakra pendant, the Circle of Happiness. It comes on a braided leather necklace 20"/50 cm.